An Israeli military college has printed damning soldiers' accounts of the killing of civilians and vandalism during recent operations in Gaza. One account tells of a sniper killing a mother and children at close range whom troops had told to leave their home. Another speaker at the seminar described what he saw as the "cold blooded murder" of a Palestinian woman. The army has defended its conduct during the Gaza offensive but said it would investigate the testimonies. 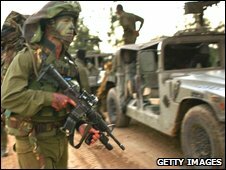 The Israeli army has said it will investigate the soldiers' accounts. The testimonies were published by the military academy at Oranim College. Graduates of the academy, who had served in Gaza, were speaking to new recruits at a seminar. "[The testimonies] conveyed an atmosphere in which one feels entitled to use unrestricted force against Palestinians," academy director Dany Zamir told public radio. Heavy civilian casualties during the three-week operation which ended in the blockaded coastal strip on 18 January provoked an international outcry. Correspondents say the testimonies undermine Israel's claims that troops took care to protect non-combatants and accusations that Hamas militants were responsible for putting civilians into harm's way. The Palestinian woman and two of her children were allegedly shot after they misunderstood instructions about which way to walk having been ordered out of their home by troops. "The climate in general... I don't know how to describe it.... the lives of Palestinians, let's say, are much, much less important than the lives of our soldiers," an infantry squad leader is quoted saying. In another cited case, a commander ordered troops to kill an elderly woman walking on a road, even though she was easily identifiable and clearly not a threat. Testimonies, which were given by combat pilots and infantry soldiers, also included allegations of unnecessary destruction of Palestinian property. "We would throw everything out of the windows to make room and order. Everything... Refrigerators, plates, furniture. The order was to throw all of the house's contents outside," a soldier said. One non-commissioned officer related at the seminar that an old woman crossing a main road was shot by soldiers. It was cold-blooded murder," he said. The transcript of the session for the college's Yitzhak Rabin pre-military course, which was held last month, appeared in a newsletter published by the academy. Israeli human rights groups have criticised the military for failing to properly investigate violations of the laws of war in Gaza despite plenty of evidence of possible war crimes. The soldiers' testimonies also reportedly told of an unusually high intervention by military and non-military rabbis, who circulated pamphlets describing the war in religious terminology. "All the articles had one clear message," one soldier said. "We are the people of Israel, we arrived in the country almost by miracle, now we need to fight to uproot the gentiles who interfere with re-conquering the Holy Land." "Many soldiers' feelings were that this was a war of religion," he added. Defence Minister Ehud Barak told Israel Radio that the findings would be examined seriously. "I still say we have the most moral army in the world. Of course there may be exceptions but I have absolutely no doubt this will be inspected on a case-by-case basis," he said. Medical authorities say more than 1,300 Palestinians were killed during Israel's 22-day operation, including some 440 children, 110 women, and dozens of elderly people. The stated aim was to curb rocket and mortar fire by militants from Gaza. 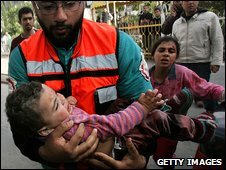 Thirteen Israelis, including three civilians were killed.